MUMBAI: Returning after a sensational 2017, Disturbing Ibiza is back with a Summer packed full of disruption from some of the biggest artists and hottest new names from around the world. Joining Tinie Tempah and DJ Charlesy will be UK rap sensation Stefflon Don, American hip-hop superstar Wiz Khalifa, Giggs, Lethal Bizzle, Yxng Bane, Bugzy Malone, and Tyga to name a few. Every Wednesday for 14 weeks, experience a line-up of the world’s biggest and freshest from hip-hop, R&B, grime, afrobeat, Old Skool Garage & UK rap. A night like no other on the island, Disturbing Ibiza opens officially on 6th June - 19th September (excluding 18th July & 22nd August). Affirming its place as one of Ibiza's most authentic parties, Disturbing Ibiza is back with an all-star lineup. Stefflon Don will heading over to the sun-soaked island of Ibiza to perform. The star of 'Cigarette' with UK up-comers Raye and Mabel, is now working with Drake and has become one of Britain's most exciting new artists. She's joined by Wiz Khalifa, the mastermind behind hits like 'Black and Yellow', 'We Dem Boyz' and 'See You Again'. With an instantly recognisable style and swagger, the rap superstar is not to be missed. Breakout star Yxng Bane was nominated for the BBC Sound of 2018, and has since continued to release hit after hit, growing a cult following in the British underground scene. Also performing will be Giggs, the legendary London-based rapper, bringing his immense back catalogue of hits. The four-million-stream artist, Bad Bunny, who is leading the Latin trap explosion will perform for the first time in Ibiza for Disturbing. There will also be headline performances by 'King of the North' hitmaker Bugzy Malone, the always-entertaining Lethal Bizzle, Mist, J-Hus, and American rapper Tyga. All of whom will be performing alongside international stars Tinie Tempah and DJ Charlesy. 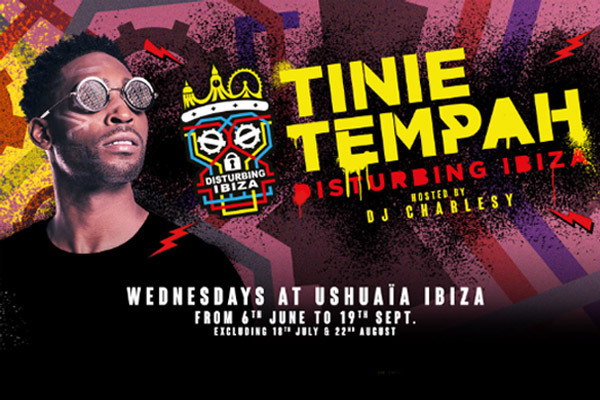 With an impressive roster guaranteed, Tinie Tempah and DJ Charlesy's fourth year of Disturbing Ibiza will see world class acts, huge productions of next level pyrotechnics, partnered with incredible sound and visuals all brought to the open air stage of Ushuaïa. Disturbing has become a staple across the globe with its widely celebrated events in London, Dubai & Ibiza as well as festival stages and one-off big shows. Disturbing Ibiza has firmly established itself as a mainstay in the Ibiza calendar, becoming one of the most successful nights on the island in 2017. The return of it’s Ibiza residency will definitely not be one to miss. Watch out for huge special guests from the world over to drop into the Island's biggest weekly party.